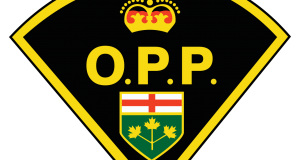 Members of the Marathon and Manitouwadge Ontario Provincial Police (OPP) detachments responded to four separate motor vehicle collisions that occurred on Highway 17 in a little over a four hour period. April 16, 2018 at 09:23pm officers attended a single motor vehicle collision (MVC) near the Prairie River Bridge on highway 17. The vehicle left the roadway coming to rest in the ditch with no injuries to the occupants. The vehicle is to be removed today when weather conditions allow. At 10:22pm officers were alerted to a second single MVC 3km west of Marathon on highway 17. A west bound motor vehicle left the roadway coming to rest in the ditch with minimal damage and no injuries to the driver. The vehicle was removed shortly after the incident. At 11:40pm officers attended a third single MVC on Peninsula Road near highway 17. A vehicle left the roadway coming to rest in the ditch with minimal damage and no injuries to the occupants. The vehicle was removed shortly after the incident. Again at 01:39am on April 17, 2018 officers attended a forth single MVC 40km west of White River on highway 17. The motor vehicle left the roadway coming to rest in the ditch with minimal damage and no injuries to the two occupants. In this incident the driver, a 35 year old male of Muskoday, SK was charged with two Highway Traffic Act offences. The motor vehicle is to be removed when weather conditions allow. The highways were open at the time of the MVC’s but was not the most favourable driving conditions due to the weather and road conditions. Anyone needing information on road conditions are asked to call 511 for updated conditions supplied by the MTO.